I hasten to inform the esteemed community of news about the small but significant changes. Once upon a time, Russian collectors Zippo lighters have been left to themselves, and only then in the community ru_zippo popular LiveJournal, but a few scattered branches not thematic forums were a platform for their active communication. In 2008 appeared Zippo Collector , on the basis of which was formed a year later the first Russian Zippo-forum subsequently grew into a separate project. And in 2013 there was a massive thing for the community today, Zippo Fan Club network "VKontakte", which today brings together more than 25,000 participants. Today I am pleased to announce that we have decided to come together under one name! With the support of the official Russian distributor Zippo Mfg Co, the company "GALSER" we now call the official collectors club Zippo Club Russia! 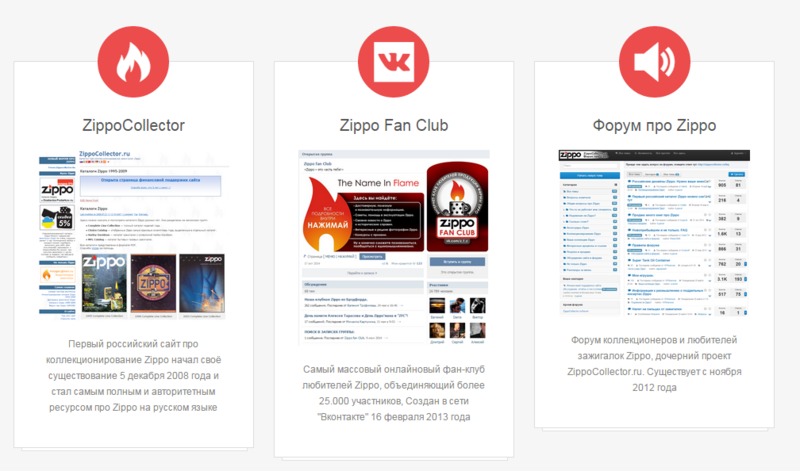 Certainly belongs with respect to the habits of all our members, we decided to technically integrate our platform into a new (yes it would be impossible), but to create on their basis of a single club of Russian collectors Zippo Club Russia, which are now combined under one sign on equal rights of both the online project. For all those who habitually Vkontaktik or collector, and who is proud to belong to one or another club (and many of the participants will be held immediately in both), everything remains the same. But today all participants Zippo Collector and Zippo Fan Club automatically become members of the official Russian club Zippo Club Russia. Today, the site is open and ZippoClubRussia.Ru , which now becomes the official main entrance for all fans of Zippo (new and old) and a single brand club. But of course, all forums will continue to work on their previous sites, and no one has to run and register again! C Merry Christmas and a Happy New Year! This entry was posted on Wednesday, June 3rd, 2015 at 20:33 and is filed under News . You CAN follow Any responses to this entry through the RSS 2.0 feed. You can skip to the end and leave a response. Pinging is currently not allowed. Specialty shop Zippo-Moscow offers Zippo lighters at very good prices! We have a full choice and everyone will be able to choose a lighter for yourself. For buyers who came to the rally Zippocollector.Ru: when buying lighter fuel and cover as a gift (do not forget to tell the operator). Today the site has been 312 visitors yesterday - 522 visitors. On site right now 6 visitors. Site ZippoCollector.ru is a special project of the author. Company Zippo Manufacturing Company and its official representatives. When borrowing any material, please put a link to the site.